BERLIN -- German authorities say a forest fire near a village southwest of Berlin is under control, but the situation remains precarious because of unexploded World War II ammunition that's buried in the ground there. The German news agency dpa reported Friday that it was difficult for firefighters to get inside the pine forest near Fichtenwalde, 22 miles from the capital, because there were indications that some of the munitions may already have detonated due to the fire and that the safety of the firefighters might be at risk. Like much of Europe, the Berlin region has been experiencing unusually hot and dry weather in recent months and authorities have warned that the risk of wildfires is very high. 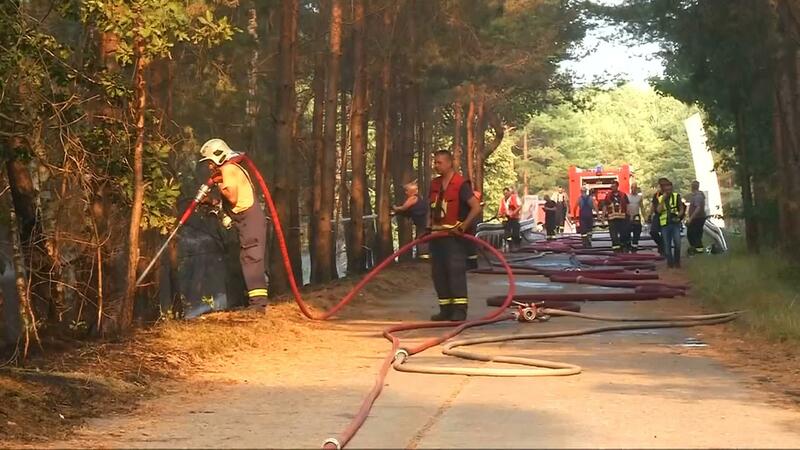 Earlier authorities had warned residents of Fichtenwalde to prepare for possible evacuation due the fire. Brandenburg state officials said residents should pack clothing, important documents and medications ahead of a possible evacuation. Raging Calif. wildfire turns deadly, forces "mass evacuations"
Officials said the fire had already burned 222 acres of pine forest. The risk of unexploded WWII ordnance aside, Germany's wildfires have done relatively little damage compared to the blazes which decimated villages near Athens, Greece this week. At least 82 people died in those fires, which officials say may have been caused by arsonists.